While working as a coffee house barista, I gradually learned an important lesson: a barista is more than just a barista. Often, you are the individual that people look forward to seeing every day. Besides arriving for their daily dose of caffeine, customers come to the café to be recognized and acknowledged. Doing just that became one of my favorite parts of the job. I tried to remember everyone’s names and drink orders in order to show them that they were noticed and appreciated. In doing so, I soon realized what an incredible opportunity I had at my job to witness for Christ and demonstrate his love through my work. A pivotal way to witness in the workplace is by reacting well when people treat us poorly. I experienced this firsthand with an elderly woman who was a regular at our café. Every evening, I struggled with serving her. She would come to get her latte and always seemed to be unhappy, displaying a constant scowl on her face. She barely spoke to us when she came in but only looked down, placed her order, and walked away without making eye contact. I soon realized God had placed a great opportunity right in front of me to make a difference and do what I could to put a smile on her face. She looked up at me, and her eyes began to glisten with tears. “You noticed I was gone?” she asked in surprise. I told her that yes, I had, and I asked how she was doing. She began sharing her recent struggles regarding her job and family, and I assured her that I would be praying for her. From that day on, she came into the store radiating more and more enthusiasm as I and my coworkers would come around the register and wrap her in a giant hug. She told me that the daily trip to the coffee shop was her favorite part of the day because of how special she felt every time she walked in. Without our interaction, this woman would have continued to suffer silently. No one would have known the pain she was carrying. She may not have had anyone to pray for her or even just reach out and give her the hug she needed. God gave me the opportunity to share the gospel and his love to someone who desperately needed the hope found in Christ. We keep in touch to this day, and I am so grateful to be a part of her life. What a beautiful reminder of how God changes us from the hardened and broken people that we once were, makes us new, and restores us in him! God gives us one-on-one interactions with people every day who need to be told the good news. Sacrificing time and energy out of our day to share the gospel may seem tedious and awkward, but that sacrifice pales in comparison to the ultimate sacrifice that Jesus paid on the cross. He paid the high price so that we are able to tell everyone the most exciting and life-giving news ever. As Luke 8:16 says, “No one after lighting a lamp covers it with a jar or puts it under a bed, but puts it on a stand, so that those who enter may see the light.” The darkness and sadness of this world is being conquered by the light of Christ’s saving work on the cross, and we should be looking for every opportunity to share it. Taken from the article in the February 2019 edition of New Horizons, written by Charisa Dorn, member of Faith Orthodox Presbyterian Church in Long Beach, California. 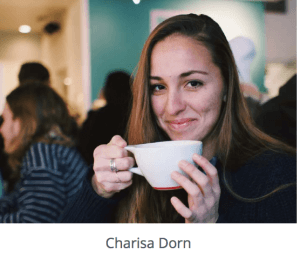 Charisa made an intentional choice to love people as those created in the image of God in the place that God put her. What would that look like in your life? What would be the first step in your life to show love to the people around you?